The Funny Farm Lodge is a old 19th-century farm house that has been expanded into a five-bedroom family residence. 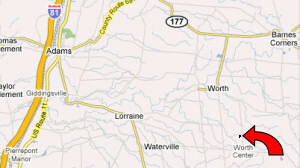 We are located a short 20 minute drive from Route 81 in Worth Center, NY which makes for quick and easy travel. 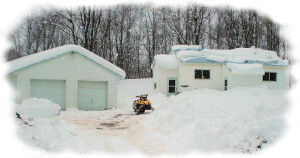 Once you arrive, you can ride, hunt, ski or snowshoe right out of the driveway. We are adjacent to more than 1000 acres of State (DEC) and County lands. We are right on the old corridor trail at the border of Jefferson, Oswego and Lewis counties. We are about halfway between the old Lake Effect/Snow Belt Inn and Barnes Corners providing quick access to gas, food and services. We operate as a modified bed and breakfast with simple family-friendly rooms and large common areas. Each room in the Funny Farm accommodates 3-4 people with a shared hall bath for a total of about 13 people. 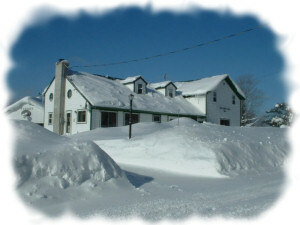 Rooms in the Funny Farm Lodge are $50 per night per room on the weekends with a two-day minimum during the snowmobile season. A three-day minimum is required on Martin Luther King weekend and Presidents weekend. Each room is $35 per night during the week. The Coo Coo Nest is a separate two-bedroom house located just down the road from the Funny Farm. It was completely renovated in 2008 to provide a cozy, comfortable stay. It accommodates 4-6 people and is perfect for families or small groups. It is currently for sale.